I received an Advance Readers Copy of this novel from NetGalley. That does not affect my review in any way. Here’s a quick synopsis of the book from Goodreads: A passionate and powerful novel based on the scandalous life of the French novelist George Sand, her famous lovers, untraditional Parisian lifestyle, and bestselling novels in Paris during the 1830s and 40s. 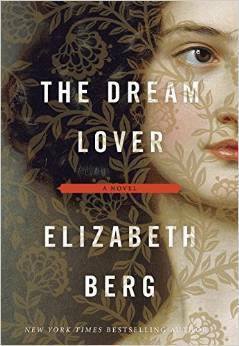 This major departure for bestseller Berg is for readers of Nancy Horan and Elizabeth Gilbert. This novel was a very interesting one and one in which I don’t think I would have picked had I not recently heard of George Sand in one of my classes. I’ve recently become more interested in history novels so this one and its beautiful cover appealed to me. There was just something about the cover that drew my attention and then I read the synopsis and I thought it would be pretty good. I was luckily enough to get a digital copy and as such I dove into it (hoping to finish before it released– which I did). All in all I’d have to rate this novel a 3 out of 5. While it was very interesting it was also very slow and hard to get through. I can typically read a book very fast but this one just was not working for me. I wanted to finish it though because the subject was interesting to an extent. Some things within the novel got old really fast and I wish there would have been more on the woman besides her elaborate love life and the unhappiness she felt. The way it was set up was pretty typical for a historical novel with the dates and places, but sometimes I wished for something a little different. I got tired of hearing about the different lovers. George Sand led a very interesting life as seen through this novel. It was a very fascinating read that critiqued the different forms of love and even made some comments on feminism. I was sold by the character. There was no doubt that this was George Sand’s story, but the way it was written made it hard to get through. Perhaps I would have enjoyed it more if there had been more of George’s novels within the book. A vast number of them were mentioned but not from a writer’s perspective I felt. It felt like each novel was just see through their different themes. As a creative writer myself I know that I don’t look at my own work for the theme it provides. There were some very beautiful lines within the novel and it was refreshing to see the diversity in characters that we were introduced to. I think my favorite lover of George’s was Chopin. Mostly because I turned on his music and listened to that as soon as he was mentioned. So for the very end of the novel I had the musical accompany of Chopin. It certainly made the last 20 % of the novel fly by. I was very enthralled by the psychological issues that are raised within this novel. If I had to pinpoint a favorite thing about the book it would be that. I’ve seen many people deal with some of the issues in the novel. Reading it though made me feel like George was bipolar at times. Her ups and downs were just so extreme. Love was approached in varying ways within the novel which made it interesting. At a certain point though I was a little tired of it. My love for the love (ha) was rejuvenated once Chopin came in. I think I’d lost it with the Doctor in Italy initially. Overall it wasn’t a bad book but the pace was off putting and the excessive line of lovers was a little tiresome. How that woman put up with that lovers I will never know. She was a very interesting woman who had a lot to say and deserved to say it. There just should have been more to the story than the lovers and the elaborate Parisian life she lead. It was an interesting read but not one I plan on picking up again. It took me 11 days to read it… that’s almost unheard of with books, even those for school. I hope this review was helpful! Until later Chaos Seekers!